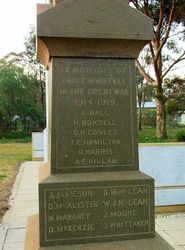 Illabo War Memorial was originally erected to commemorate those died in service or were killed in action during World War One. The memorial was refurbished and is now dedicated to those who have served in all conflicts in which Australia has been involved. 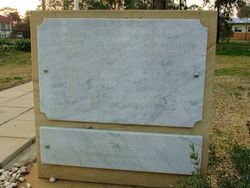 Behind the original war memorial are three granite blocks which contains marble plaques. 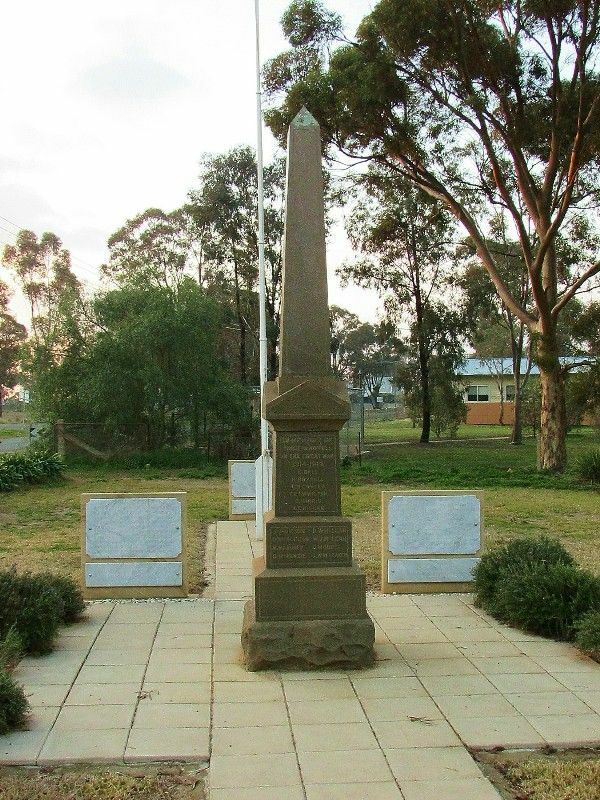 Two of the plaques contain a roll of honour while the third plaque behind the flagpole is in recognition of the contribution made to the district by the founding members of the soldier settlement blocks. 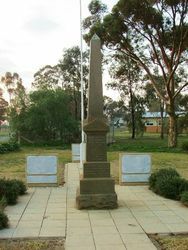 ILLABO SOLDIERS' MEMORIAL. "They came from hillside, the plains, town, city and village," and the village of lllabo answered the call, and from its small population sent 75 soldiers to the Great War, a fifth of whom paid the supreme sacrifice. To honor the quick and the dead who took part in the late war a large gathering was present at Illabo on Saturday to witness the unveiling of an obelisk to fallen heroes, and an adjacent honor roll of stone, surmounted by a machine gun, a trophy of the war. The chairman made an appeal for funds to make the surrounding area a park for the people. The monument had cost £200, of which there was an amount of but £35 owing on same. As a result of the appeal £37/12/0 was the ready response, which left the monument free of debt prior to the unveiling. Mrs. McLean, a lady of advanced years, came forward at the invitation of the chairman, and unfurled the Union Jack covering the obelisk. The compliment paid Mrs. McLean was a tribute to the fact that two of her sons had paid the supreme sacrifice. 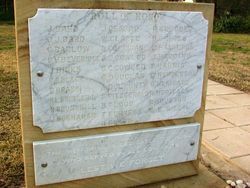 Simultaneously Mr. Hugh Main, M.L.A., unveiled the adjacent monument containing the names of 61 of those who had returned from the war zone. Included among the names was that of H. Main, M.L.A., who was that day one of the speakers. 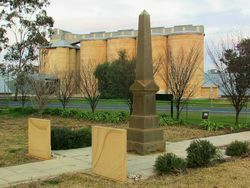 The two monuments stand in a triangular piece of ground in portion of the public school playing ground area and facing the main Cootamundra road and the trunk southern line. 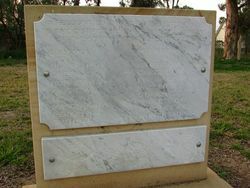 The work reflects every credit on the contractors, S. Dixon and Sons of Cootamundra. The chief piece of work, the obelisk, which stands nine feet high, is of polished grey granite. Daily Advertiser (Wagga Wagga, NSW), 20 June 1922.